The perfect wheel coating kit! The McKee's 37 Wheel Coating Kit contains everything you need to clean, prep, and coat your wheels with long-lasting, ceramic protection. This money-saving kit features the color-changing Foaming Wheel Cleaner Gel, Wheel Coating, plus the essential brushes and applicators needed to apply each respective product. Your wheels have never looked this good! When you use McKee's 37 Foaming Wheel Cleaner Gel, you can be confident that it will safely and effectively clean all types of wheels. Its water-based, surface-friendly formula removes brake dust and oily road grime while maintaining the wheel finish by dissolving ferrous iron particles. 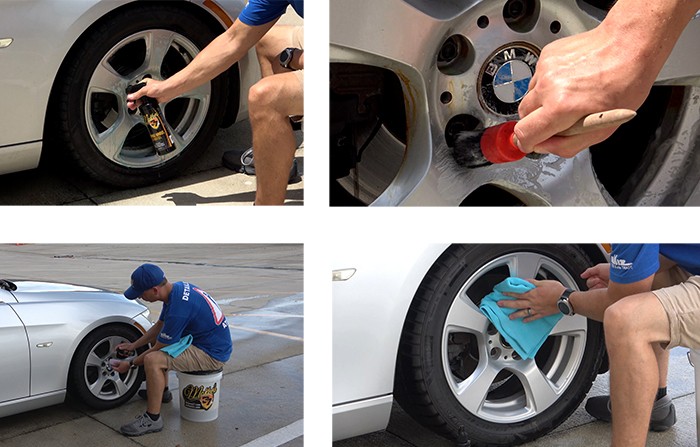 McKee's 37 Foaming Wheel Cleaner Gel uncovers the shine of all types of wheels, including factory clear coated wheels, painted, polished, and plated wheels. It works so well that it changes color as it dissolves brake dust. McKee's 37 is a nano-glass ceramic coating that provides your wheels with unparalleled protection against brake dust, dirt, road grime, oil and tar. Formulated using nano-glass ceramic particles, McKee's 37 Wheel Coating blankets your wheels in a durable, high-gloss protective barrier that resists brake-dust build up, keeping your wheels clean and protected in between regular washes. A single application lasts up to 1 year! This super soft applicator is comprised of micro-suede wrapped around a foam core. It's easy to hold onto, and the unit material evenly distributes McKee's 37 Wheel Coating. Use this soft-bristled brush to gently agitate Foaming Wheel Cleaner Gel. It is perfect for delicate leather surfaces that would otherwise be scratched or marred by a stiffer brush. The wooden handle will not get slippery when wet. Use this handy waffle weave towel to dry your wheels after cleaning them. Total retail value of $81.95. You save $21.96! Long Lasting and Easy 5 I used this as directed in your video and per directions on bottle. This is so easy to use and wheels look clean and bright everyday. I put the treatment on about 3 weeks ago and the wheels still look shiny and bright. Cleaned great 4 Product great , sprayer sucked. wheel coating kit 5 works great and easy to use. McKee's 37 Xtreme Iron Remover, 32 oz. McKee's 37 Xtreme Iron Remover 128 oz. New Formula!